Known as the sunshine vitamin, D3 deficiency it at an all-time high. Currently it is estimated that over 50% of the world's population are deficient in Vitamin D3, and some groups more than others are in more of an immediate risk. 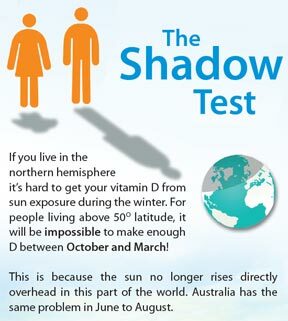 Vitamin D3 is produced naturally in the skin when we are exposed to ultraviolet light - but what happens to those of us who wear sunscreen or don't live in the sun? Age - If you are over 50 years of age you are at risk, and the older you get, the greater your chances are you are deficient. Skin colour - if you have darker skin & increased pigmentation with heritage from the Middle East, India or Africa your skin is missing the sun. Overweight or obese? Your fat cells 'collect' Vitamin D3 depriving the rest of your body. The more you weigh, the more Vitamin D3 you need, and it is true for both overweight people and very muscular people too. Feeling sad? There is a direct link between low levels of Vitamin D3 and depression. Crohn's disease, celiac and gluten sensitivity compromise your body's absorption of Vitamin D3 - you need to supplement. Sweaty head? This is a classic sign you need more D3. Can I eat to improve my Vitamin D3 levels? Nope. We're afraid not. It is a 'sunshine' vitamin, created in your skin after exposure to sunlight, so no amount of lovely fruits and vegetables will have an effect on this particular vitamin. Vitamin D3 is a hormone made in the skin by the action of sunlight on cholesterol - that’s why supplementing - especially here in the Northern Hemisphere is vital to you and your family's health because it is practically impossible to make enough Vitamin D3 between October and March! How will I benefit from supplementing with Vitamin D3 800 IU? Calcium and bones - Vitamin D3 works to help your body absorb calcium making your bones stronger. Stronger muscles - a classic example of this is for anyone with a weak pelvic floor. 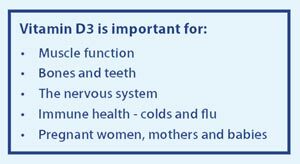 Clinical studies show that women with low D3 have weak pelvic floors, but supplementing with Vitamin D3when exercising gets better results. Amazing! Immune System - low levels of vitamin D3 are linked with 40% increase in respiratory problems. Studies have also shown that vitamin D may stimulate the body's production of anti-viral and anti-bacterial proteins. Some experts prefer vitamin D over vitamin C when considering cold and flu protection. Why should I take Pharma Nord Bio-Vitamin D3 800 IU? IU stands for International Units and it relates to a measurement for drugs and vitamins. With Pharma Nord Bio-Vitamin D3 800 IU we recommend you take between 1-5 capsules per day, or as recommended by your GP or health provider. Let the sunshine into your body with Pharma Nord Bio-Vitamin D3!